KNCV Tuberculosis Foundation regularly supports PhD candidates. This week we welcome Abdallah Mkopi from Tanzania, and last month Sanne van Kampen successfully defended her PhD thesis. Abdallah Mkopi of the Ifikara Health Institute will defend his doctorate thesis on ‘Patient-centered TB treatment in Tanzania’. This will take place on November 5 at the University of Amsterdam. KNCV supported him with scientific supervision. More information is available on the website of the University of Amsterdam. 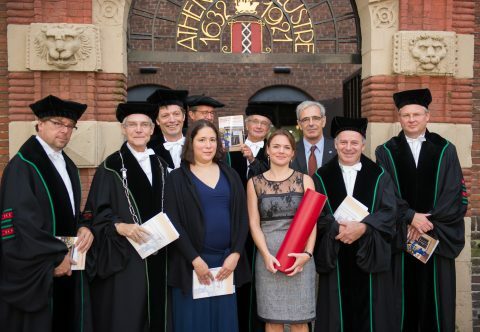 On 10 September 2015 our former colleague Sanne van Kampen successfully defended her PhD thesis on on the ‘Implementation of New Diagnostics for Tuberculosis. Bridging the Gap between Global Policy and Local Practice.’ Her supervisors were Prof. P.R. Klatser and Prof. F.G.J. Cobelens. KNCV warmly congratulates Sanne on achieving her doctorate at the University of Amsterdam. Sanne van Kampen worked for KNCV Tuberculosis Foundation for four years as Technical Officer Laboratory Services in Xpert MTB/RIF implementation and provided technical assistance to the National TB programs of Nigeria, Indonesia, Vietnam and Kazakhstan.